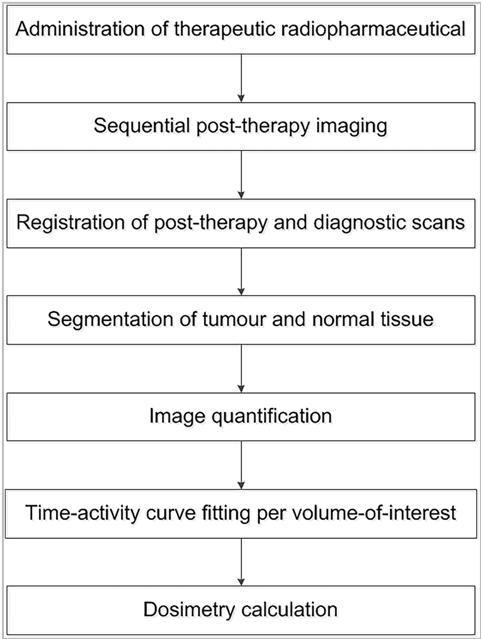 Nuclear imaging-based biomarkers and targeted radiotherapy are integral components of many aspects of clinical research and routine practice. However, how is the dose of radiation given to sensitive organs and tumours determined and measured? Dosimetry is the term used to describe the “study, measurement, method of measurement or instrument of measurement of radiation dose”. 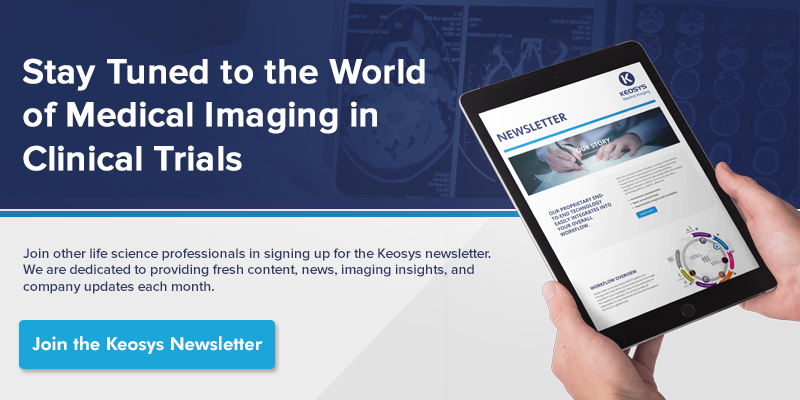 This post introduces the concept of internal dosimetry – focusing on nuclear medicine imaging tracers and targeted radionuclide therapy (TRT) – and how it is used in clinical trials. Radiation exerts harmful or therapeutic biological effects (e.g., DNA double-strand breaks) depending on the dose. Therefore, different radiation dose measurements are necessary to ensure that the intended outcome is achieved. First though, definitions of important terms used in the field are given below. Absorbed dose: the fundamental quantity of radiation (measured in becquerels (Bq)) deposited in an absorbing medium. The unit of absorbed dose is given in grays (Gy). The absorbed dose of a TRT is usually calculated using the methodology developed by the Committee on Medical Internal Radiation Dose (MIRD). Equivalent dose: takes into account the type of and energy of the radiation to convert the absorbed dose in organs and tissues to calculate a whole-body effective dose. It is primarily used to determine the health effects of low levels of ionizing radiation on the human body. The unit of equivalent dose is given in sieverts (Sv). Biological effective dose (BED): uses a mathematical model (linear quadratic) to relate the absorbed dose and dose-rate with the level of radiosensitivity and repair rates of tissues/organs. The BED represents the dose required for a given biological effect when delivered at very low dose-rates. It is usually used to compare the effects of total absorbed doses delivered at different dose-rates. Internal dosimetry in clinical research has grown in importance as the number of TRTs being developed has increased. Indeed, as well as monitoring how much radiation a patient receives, the European directive on basic safety standards mandates that treatment plans for radiopharmaceutical therapies are dosimetry based. Dosimetry protocols and analyses will depend on the goal of the trial. If a new diagnostic nuclear medicine agent is under investigation, the aim is to ensure that the delivered dose is low enough to prevent or limit any biological side effects while maintaining optimal conditions to perform diagnosis. Conversely, if evaluating a new TRT, then the aim is to trigger therapeutic biological effects (e.g., destruction of a tumor) while limiting irradiation of surrounding healthy tissue/organs. That is, to establish the minimum effective absorbed dose and maximum tolerated absorbed dose. Calculations of the absorbed dose are based on modelled biodistribution data (e.g., from Olinda/EXM) and/or on quantitative analyses of medical images (e.g., obtained via SPECT and PET) depending on the context, and can seem a formidable task. Calculation takes into account the individual physiological characteristics of patients, the pharmacokinetic and biodistribution of the TRT and the nature of radiation involved to name but a few. The development of peptide receptor radionuclide therapies (PRRTs) for neuroendocrine tumors (NETs) illustrates the wide range of dosimetry protocols and analyses available. In a review of published dosimetry methods, 288 unique articles were identified from the literature search! Notably, for clinical trials, individual pre-therapeutic dosimetry was necessary for patient selection and therapy planning. This is due to the significant inter-patient differences in radiopeptide uptake between normal organs and tumors. There is great diversity in the dosimetry methods and image processing algorithms available. However, numerous guidelines are available to help promote standardization and accuracy. Examples include those developed by the MIRD, which aims to reduce complex dosimetric analyses to simpler methods. The International Atomic Energy Agency (IAEA) and the European Association of Nuclear Medicine (EANM) are also some of the agencies involved in developing guidelines, such as the “good practice of clinical dosimetry reporting”. Quality assurance and audits of treatment centers further ensure standardization and accuracy. A project of particular interest is MEDIRAD, a vast endeavour involving 33 institutions from 14 European countries to “enhance the scientific and clinical practice of radiation protection in the medical field”. One of its objectives includes research to improve organ dose estimation and registration by comparing existing methodology and tools. Including dosimetry as part of a trial protocol requires highly specific techniques and workflows (an example workflow for PRRT for NETs is shown in the figure). Some of the numerous points to consider include the quality and consistency of images for calibration and analyses, and selecting the most suitable pharmacokinetic model. Organizing dosimetry analyses is also challenging, particularly if both images (e.g., SPECT and whole-body scans) and blood and urine dosing data are required. That is, close coordination and follow-up of collection of blood and urine samples from subjects is vital to ensure that everything is delivered on time to dosimetry teams for accurate analyses. Moreover, dosimetry for clinical trials might require scanners, gamma counters and dosimeters to be calibrated in a way that is considerably different to that of standard clinical routine practice. These are some of the reasons why dosimetry is often outsourced to specialist teams. 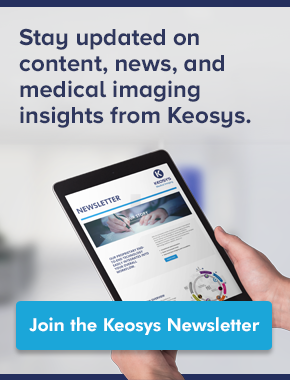 Keosys is one such company, and our involvement in the pivotal trials of Lutathera (a PRRT) demonstrates our expertise.